The Project Copyright Transfer Agreement can be used to transfer the copyright to another party. This can be used if you are turning over ownership for a new site or if you are not going to be maintaining the site anymore and the client wants the rights to it. This agreement is tailored more for written articles and publications, however can be used for any written works or artwork. pleased with the multiple number of contracts for different scenarios and I also liked the advice given throughout the different manuals. You turned what would usually be a time-consuming, expensive process into an easy and affordable one that gives professional results." This Project Copyright Transfer Contract is included in editable Word format that can be customized in Word or by using the included Wizard software. THIS AGREEMENT is made this Current Day day of Current Month, Current Year by and between Company Name (hereafter referred to as "Author") and Company Name (hereafter referred to as "Client"). 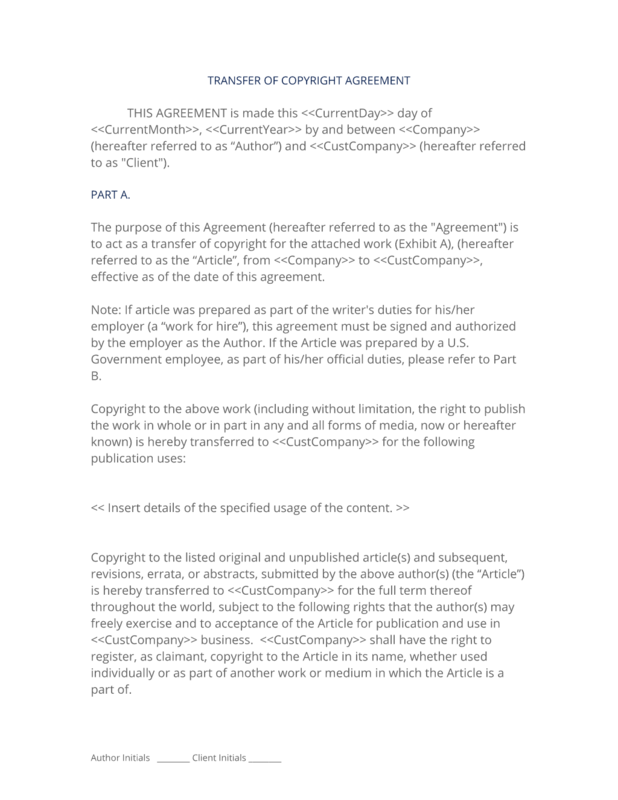 The purpose of this Agreement (hereafter referred to as the "Agreement") is to act as a transfer of copyright for the attached work (Exhibit A), (hereafter referred to as the "Article", from Company Name to Company Name, effective as of the date of this agreement. Note: If article was prepared as part of the writer's duties for his/her employer (a "work for hire"), this agreement must be signed and authorized by the employer as the Author. If the Article was prepared by a U.S. Government employee, as part of his/her official duties, please refer to Part B.
Insert details of the specified usage of the content. Copyright to the listed original and unpublished article(s) and subsequent, revisions, errata, or abstracts, submitted by the above author(s) (the ''Article'') is hereby transferred to Company Name for the full term thereof throughout the world, subject to the following rights that the author(s) may freely exercise and to acceptance of the Article for publication and use in Company Name business. Company Name shall have the right to register, as claimant, copyright to the Article in its name, whether used individually or as part of another work or medium in which the Article is a part of. The author(s) shall retain the following rights so long as the author(s) agree that all copies of the Article made under any of these following rights shall include notice of the Company Name copyright. All proprietary rights and patent rights other than copyright and the publication rights transferred to Company Name. The nonexclusive right, after publication by Company Name, to give permission to third parties to republish the Article or a translation thereof, or excerpts therefrom, without obtaining permission from Company Name, provided the Company Name - published version is not used for this purpose and provided the Article is not to be published in another journal or web site. If the Company Name version is used, permission from Company Name must be obtained. The right to post their own author-versions of reprints and revisions, to use all or part of the Article without revision or modification, including the Company Name - published version, in personal collection or other publications of the author's own works, so long as the Company Name copyright notice is attached. The right of an employer to make copies of the Article so long as it was prepared by an employee within the scope of his or her employment and only for the employer's own internal use. In the case of work performed under United States Government contract, Publisher grants the U.S. Government royalty-free permission to reproduce all or portions of the Article and to authorize others to do so for U. In the event that the Article is not accepted and published by Company Name, this agreement becomes null and void. By signing this Agreement, the author warrants that the Article is original with the author and does not infringe any copyright or violate any other right of any third parties, and that the Article has not been published elsewhere, and is not being considered for publication elsewhere in any form, except as provided herein. If each author's signature does not appear below, the signing author(s) represent that they sign this Agreement as authorized agents for and on behalf of all the authors, and that this Agreement and authorization is made on behalf of all the authors. The signing author(s) (or, in the case of a work made for hire, the signing employer) also warrant that they have the full power to enter into this Agreement and to make the grants contained herein. If any provision of this agreement is held to be unenforceable, the enforceability of the remaining provisions shall in no way be affected or impaired thereby. This agreement and any disputes arising here under shall be governed by the laws of State state, without regard to conflicts of laws principles. A failure by any party to exercise or delay in exercising a right or power conferred upon it in this agreement shall not operate as a waiver of any such right or power. In the case of a work that was performed under a U.S. Government contract, but you are not a U.S. Government employee, please sign the transfer form above and review Item (5) above. The following certifies that the author(s) of the listed Article (see Exhibit A) are employees of the U.S. Government and the work was performed as a part of their employment and that the Article is not subject to protection under U.S. Copyright. The complete Project Copyright Transfer Contract - with the actual formatting and layout - is available in this Contract Pack.